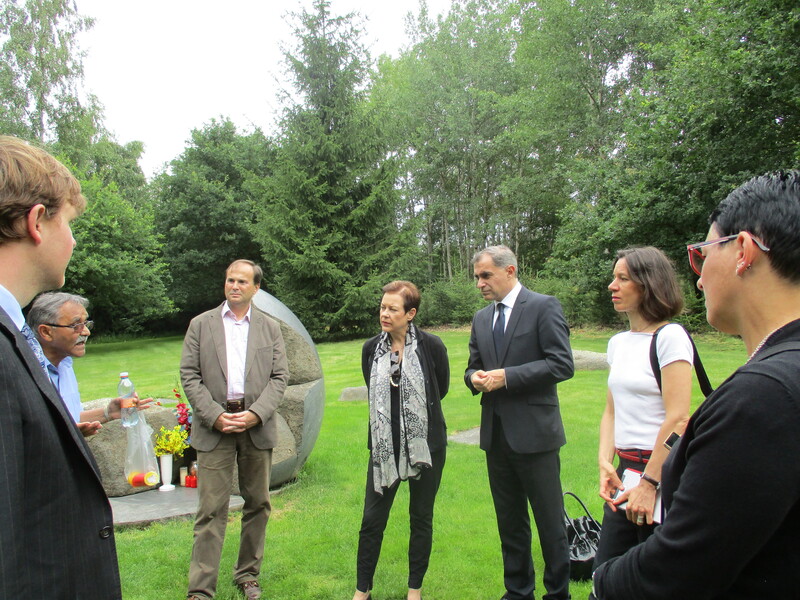 On 12 July an IHRA delegation including the IHRA Chair, Ambassador Mihnea Constantinescu, attended high level meetings in the Czech Republic to discuss the future of the former concentration camp site of Lety u Pisku. The IHRA delegation consisted of the IHRA Chair, the IHRA Executive Secretary, Dr Kathrin Meyer, as well as the Chair of IHRA's Committee on the Genocide of the Roma, Martina Maschke, ODIHR's Senior Adviser on Roma and Sinti Issues, Mirjam Karoly, and Andreea Mocanu of the IHRA Chairmanship team. Currently there is an industrial pig farm on the site of the former concentration camp. Over 1,300 Roma and Sinti were interned in Lety during the German Nazi occupation- 326 perished in the camp and over 500 were sent to Auschwitz-Birkenau. After the war, the existence of the Roma camp was practically forgotten outside the Roma community, except by specialized historians. During the 1970s, the factory pig farm was constructed on the site of the Lety camp. The Lety Memorial stands on the site of a mass grave, outside the area of the concentration camp. The visit began with a site visit to the former concetration camp together with Mr. Cenek Ruzicka of the Committee for the Redress of the Roma Holocaust, accompanied by Ambassador Antonin Hradilek, Special envoy for Holocaust issues and combating antisemitism and Head of the Czech delegation to the IHRA, Martin Martinek, from the Office of the Government Council for Roma Minority Affairs and Mr. Jiri Kalasnikov, Department for Human Rights and Transition Policy. Mr Ruzicka, whose mother survived the camp, also took the delegation to the nearby cemetery of Mirovice where children from the camp that died from malnutrition and a typhus epidemic – including Mr Ruzicka’s younger brother - as well as adults are buried in two mass graves. Reflecting on the arrival at the site, the Chair of the IHRA Committee on the Genocide of the Roma, Martina Maschke commented “on the road from the small town of Mirovice, before we even set eyes on the pig farm, we were confronted with the overpowering smell of ammoniac. Then the industrial pig farm came into view. Finally we arrived at the small memorial site which lies outside of the former camp. To have a pig farm on the site where people suffered and lost their lives is a complete desecration of the site." IHRA’s Committee on the Genocide of the Roma has been examining the situation of memorial sites connected to the genocide of the Roma that are in urgent need of improvement since 2014. This visit to Lety follows an earlier visit which took place in March 2015 and aims to highlighted the need for a respectful place of commemoration. In 2015 the Czech government adopted the Roma Integration Strategy 2020 which also sets the objective to find a solution for the removal of the pig farm. In line with this commitment, Minister Dienstbier, Ministry of Human Rights, Equal Opportunities and Legislation, and Minister Herman, Ministry of Culture have held meetings with the representatives of the pig farm owners, but without visible progress so far. Ambassador Constantinescu expressed concern about state of affairs and urged the Czech authorities to ensure that immediate steps were taken to initiate the removal of the pig farm. He stressed that this was the second joint IHRA/ODIHR visit and that it was necessary for there to be concrete signs of change underway before the end of the current IHRA chairmanship in March 2017. He underlined the readiness of the IHRA to support the Czech Republic in finding a solution. The IHRA Chair, ODIHR and the IHRA Committee will continue to monitor the issue closely and take further action until the situation is satisfactorily resolved. There have been a number of international calls for removal of the pig farm including EU resolutions of 28 April 2005 and 31 January 2008, Council of Europe Human Rights report of 11 March 2011, and the UN Human Rights Committee of 25 July 2013. Image: Cenek Ruzicka of the Committee for the Redress of the Roma Holocaust speaks with the IHRA delegation visits the site at Lety u Pisku.